The National Centre for Farmer Health (NCFH) will test farmers’ exposure to organophosphate pesticides over 12 months and document the effect on the farmers’ nervous systems. Flinders University toxicologist Associate Professor John Edwards said aggressive cancers, neurological and psychotic conditions had been linked to long-term exposure, but very little research had been done. What we’re trying to show to farmers is that the level of exposure they may have had today will have an impact on them. “What we do know is that farmers and pesticide sprayers are at risk of some cancers,” he said. “We don’t know which pesticides are the contributors to that disease and we don’t know whether it’s the mixture of chemicals or other lifestyle factors that might contribute. The 12-month program is only a first step towards answering these bigger questions but Professor Edwards hopes it will prompt funding and interest for further research. Organophosphates attack an insect’s nervous system, causing instant death. The question is whether they are doing something similar to humans over time. “We find that it is relatively safe, provided exposure is limited,” Associate Professor Edwards said. “However, the problem for humans is that it’s an accumulated toxin; that is, the effect accumulates over time with repeated exposure. “What we’re trying to show to farmers is that the level of exposure they may have had today will have an impact on them. Organophosphates have been banned in the United States and restricted in the United Kingdom and Europe. But in Australia the chemicals are regularly used in a list of industries including sheep, beef, grain and dairy. Associate Professor Edwards said it was hard to imagine agricultural production without them. “Remember that Australia is very, very buggy,” he said. “We have probably a greater need for effective insecticides in Australia and especially in agriculture. Associate Professor Edwards said education was more important than regulation, stressing restrictions or bans could prompt a dangerous black market. “When chemicals are banned and farmers still want to use them for economic reasons, because it helps their crop, they will find ways around the ban,” he said. 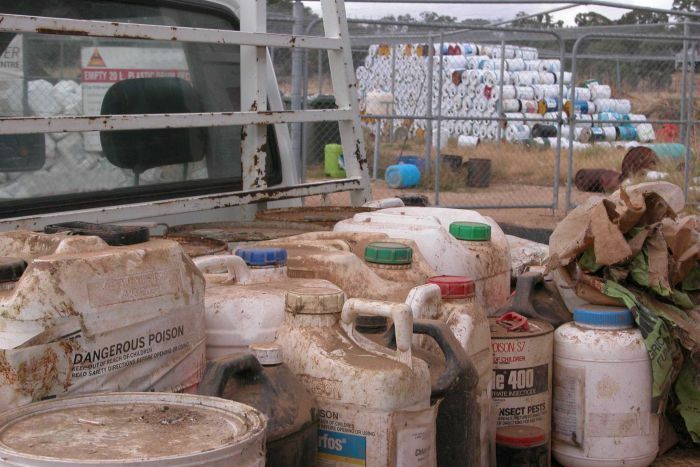 Years after organochloride pesticide DDT [dichlorodiphenyltrichloroethane] was banned in Australia, Associate Professor Edwards was called out to a number of chemical spills. “I remember someone had bought a 44-gallon drum of DDT even though it was banned,” he said. “It was so old, the drum was rusty and when he got it home it burst open and spilled all over their yard. Farmers who participate in the research will be tested every month over 12 months, and will receive instant feedback on their exposure levels. The test involves measuring the level of cholinesterase enzymes, which are needed for the proper functioning of the nervous system. Organophosphates inhibit cholinesterase, and regular tests will detail the impact of chemical use on a farmers’ enzyme levels. Associate Professor Edwards said information about the invisible impacts would empower farmers to improve safety standards. “What it becomes is a matter of farmers recognising the practices that they undertake, which increases their risk,” he said. The NCFH is calling on farmers in western Victoria to participate in the research and will set up three localities of interest in the Wimmera and south-west. This entry was posted in Human health on December 16, 2016 by Anthony.